I have a great amount of respect for the open-world games which get it right (i.e. Fallout: New Vegas, Zelda – Breath of the Wild, Horizon: Zero Dawn). However, it seems like many games nowadays are shifting to open-world just because modern consoles have enough RAM and processing power to handle them. Before this, franchises had to string isolated areas together with loading times (or other creative means, such as Wind Waker’s vast oceans). The market right now is being overwhelmed by many games implementing open-world elements, but having an open-world is not always an inherently good thing. Some games can utilize larger areas without having to change its whole structure into open-world. For this reason, I want to praise the development team of Uncharted 4, which invented the term “wide-linear”: having a focused objective but giving the player more space and freedom to accomplish them. However, poor application of an open world is not just a missed opportunity, but there are several ways it can harm the game experience. 1) If the player is given very specific objectives such as “go to point A and kill X number of enemies in this specific way”, the player, despite existing in a big open world, must act in a rigid and linear way. 2) If the story is conveying a sense of urgency, and the player is given the freedom to just mess around and go on joyrides, there is a conflict between the story and gameplay. 3) Places can lose their uniqueness. In a linear campaign mode, a location may be memorable for the fact that you can only access that location during a certain mission. But in open world games, a locale with a memorable event could be the same locale that mundane events have happened on. 4) Online play is difficult to organize in an open world where there is so much to do (or nothing to do). With Destiny 1, unfortunately, it just resulted in players of different levels occupying the same large landmass with different objectives plastered on it. 5) Open worlds which restrict the player in arbitrary ways feel artificial. With open-worlds being lifelike, people expect them to behave like the real world does. Invisible walls, for example, or an absence of objects which don’t react when the player attacks them. 6) Giving the player too much freedom to explore results in exploring losing its sense of accomplishment. In Just Cause 3, I was ecstatic that I was able to reach the highest mountain of the game within a half-hour. However, after that I felt like I didn’t have as many locations to travel to. 7) Most importantly, large areas are very difficult to fill with meaningful content. There are limited resources in game development, and with large open worlds, there is a likelihood that many areas will lack meaningful content (with miles and miles of beautiful land with nothing to do in it). We’ve seen this with GTA V, which advertised a massive overworld, and it turned out that 1/3 of the space in the game was either empty hills or a sea floor that nobody really cared out. Sometimes a dense game in which every area has meaning is better. 8) Following the previous point, a general lack of things to do in an overworld is a problem. Good open-world games have NPC’s, characters, quests, environmental puzzles, fruits, plants, animals, a variety of enemies and a lot of collectibles. But if all you can do in a world is move around in it, it’s not going to be that much fun. 9) Lack of interesting ways to traverse it. If you’re just walking around or driving around, it can get dull quickly. Open-world games should have climbing, parasailing, naval movement, a variety of vehicles. 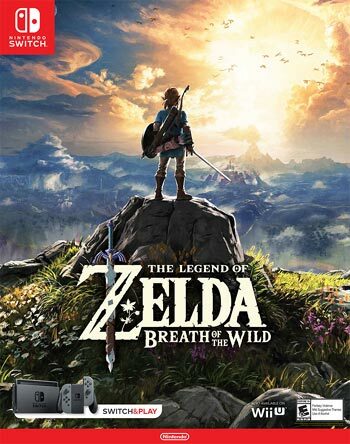 In Zelda – Breath of the Wild, as a positive example, the player is able to traverse anywhere they want so long as their stamina can handle it (in addition to verticality playing a major role). 10) Open-world games require more work to tell a great story. With increased freedom, players are not going to view every cutscene and are not all going to explore it at the same pace or order. As a result, it’s important to sprinkle elements of story throughout the overworld in creative ways. Is all of this a condemnation of the open world genre in general? Absolutely not. But this article is a reminder that if open-world games don’t find ways to utilize the benefits of having a big game world, the genre is at risk of becoming as oversaturated as first-person shooters were last generation.